Science Park of the Philippines, Inc., one of the country's leading industrial estate developers, has partnered with AboitizPower for the energy needs of its newest project, the Light Industry & Science Park IV, a 212-hectare park situated in Malvar, Batangas. LISP IV is part of a mixed-use development called Malvar Cybergreen. 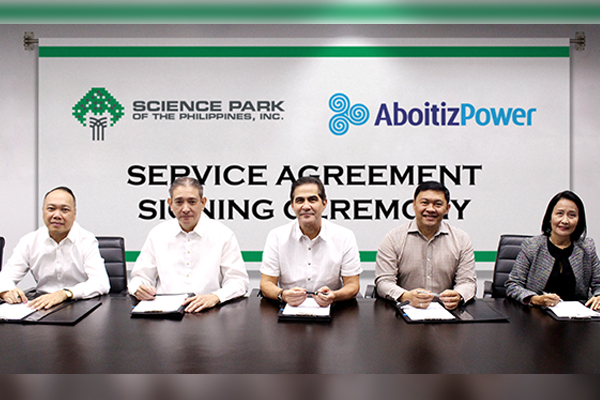 The service agreement signing ceremony between SPPI and AboitizPower was led by (from left) Bienvenido Jose Alora (SPPI vice president for industrial engineering), Richard Albert Osmond (SPPI president and chief operating officer), Jaime Jose Aboitiz (AboitizPower Distribution Business Group executive vice president and chief operating officer), Dante Pollescas (AboitizPower EnerZone Group senior vice president and chief operating officer), and Ma. Chona Tiu (AboitizPower Distribution Business Group first vice president and chief financial officer).